For some time, there's been a popular recipe circling the interwebs dubbed "man-pleasing chicken." As a namer of recipes myself, this click-baitey title just really irks me. Honestly, you shouldn't even get me started unless you want to hear me rant endlessly, which would inevitably result in my inbox filling up, so I'm not gonna go there. I've probably already opened Pandora's (recipe) box by even mentioning it. Another recipe-namer took the same dish, or a very similar one, and named it "holy yum chicken" instead. This all just makes me want to scream silent screams into the food writing abyss. Instead of screaming, I made my own iteration of this recipe, just so I could rename it: rosemary honey mustard chicken. Now readers everywhere can know what the heck it is without even having to click on it if they don't want to. My version uses honey, however, I think Alaska birch syrup would be brilliant instead. Had I had some on hand I would have used it, but sadly, I'm all out. Also, I added thick slices of fresh summer peaches to the pan with the chicken and the rosemary honey mustard sauce, because the combination of flavors makes me swoon. 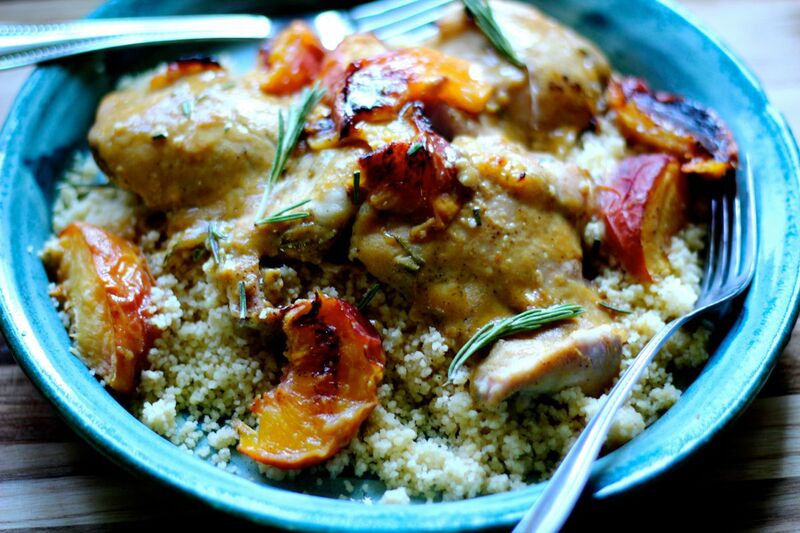 I served it all over some well-seasoned couscous, but quinoa or potatoes would also be nice. You could also grill this chicken, as well as the peaches, out on your barbecue. However, you wouldn't get all those nice pan juices to pour over everything at the end of cooking, which is probably my favorite part. Preheat oven to 450 degrees. Line a small sheet pan with aluminum foil. Place the chicken and peaches onto the sheet pan in a single layer. Season the chicken thighs and peach slices on both sides with salt and pepper. In a small bowl, stir together the mustard, honey, vinegar and rosemary. Season with salt and pepper. Brush the mixture evenly onto the chicken, then drizzle the rest onto the peaches. Bake the chicken and peaches until the chicken is cooked through and beginning to caramelize on the edges, about 20 minutes, depending on the thickness of your chicken. Transfer the chicken and peaches to a serving platter. Pour all of the juices and sauce from the pan over top of the chicken and peaches before serving.